After passage of a $28.00 parcel tax that will garner the City of Wildomar almost $350,000 for maintenance, operations and programs the City of Wildomar will re-open, one, two or three ?, of its parks on April 12, 2014 by holding a swap meet, at $20.00 per spot, to go along with the Eggstravaganza Egg Hunt. To add to City Officials confusion of what a park is for, the vendors will be allowed to set up their stalls at the same time children are running about hunting for hidden trinkets, paid for with about $1,000 of their parents parcel tax. While looking over the vendor application for this day one can’t help notice the Section titled B: “Power Restrictions which requires a vendor to use either a Quiet Generator or No Power as no power is available at the park. Seems to me I recall power was added to the park for the failed “Farmer’s Market” back in March and April of 2010 when receptacles were added to the light poles in the parking lot at a cost of $3500. 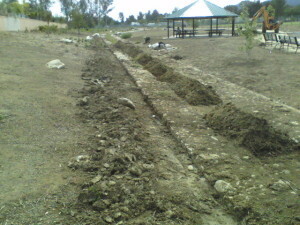 Other than this fiasco that will occur at Marna O’Brien Park the other parks are progressing. Marna O’Brien is having some work done on the parking lot, courtesy of most recent grant. None of the drains are marked and it looks like none of the filters have been replaced or repaired as required by the Regional Water Board Best Management Practices (BMP)but whats a little polluted water. 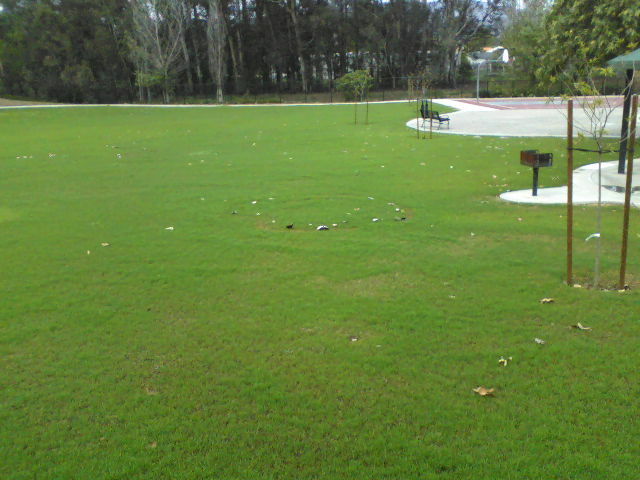 The grass, along with the shrums, at Windsong is coming along nicely. 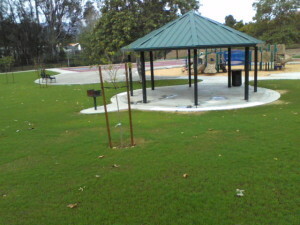 There is still the issue of replacing tables under the gazebo and the ugly fence is still in place. The white stuff on the lawn are shrums not paper. 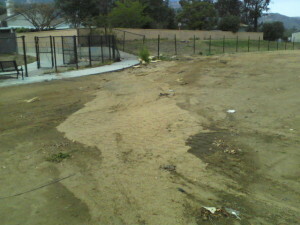 Heritage Parks is being worked on with large amounts of dirt being removed today Friday April 4. Some of the dirt still being removed. Many of the plants appear to have been scraped away in the process, but hey its only taxpayer money and donated time so what the heck. With any luck the rains will hold off returning large amounts of water and sediment, at least until people have had a little time to use it. This entry was posted in Parks and tagged Marna O'Brien, Wildomar on April 4, 2014 by Kenny. It’s a well known phenomenon that the same event can be legitimately described in nearly dichotomous tones by two or more people. I read your blog, and don’t recognize what you’re saying. I’d be happy to pick apart each of the flaws in this (which is basically the whole thing), but I don’t think you care or you would have just written it differently in the first place. 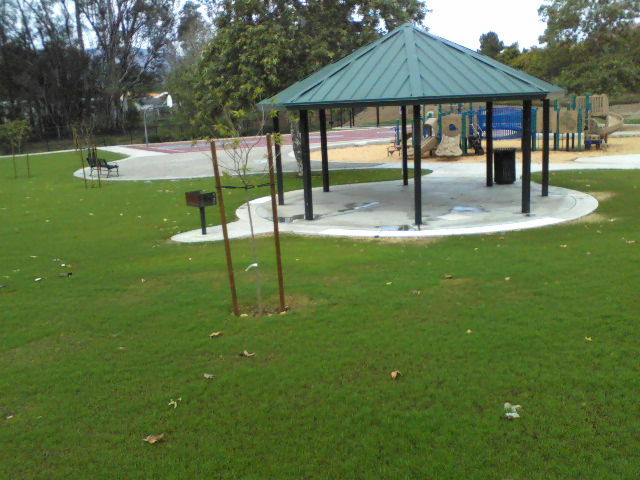 Jospeh – this blog was meant to be confusing to go hand in hand with the City of Wildomar’s concept of what parks are and when they are ready to be open. You a correct in your statement that I don’t care what people think on these issues, these are my observations and my dissemination of what I see, others may have different interpretations for what they see and are more than capable of expressing those observations. If they chose to do so here they are most welcome. 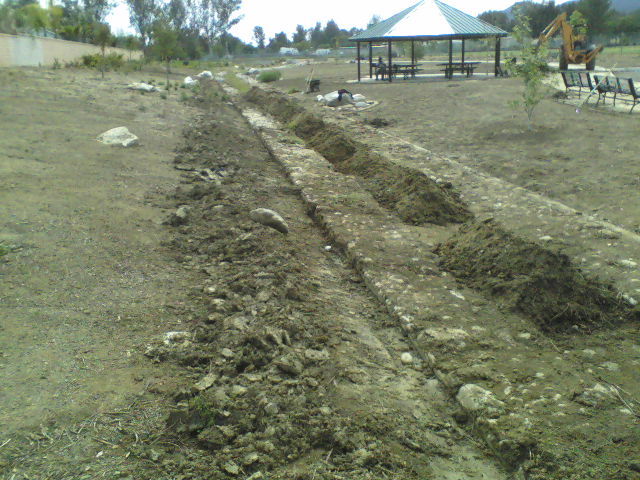 The dirt was graded at the dog park section of Heritage Park before new DG was installed. 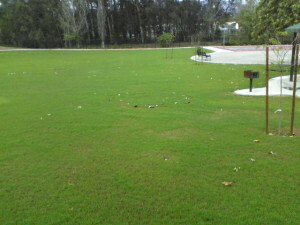 No plants were ever planted in that section of the park. I think you know where you can get current, updated pics. Doug – the reference to plants being destroyed was for the area along the drainage channel south of the bridge (the picture with all the piles of dirt to be removed), not the “dog park” portion of the park. Until such time as the channel going north out of the park remains unimproved the dog park will become a lake with every rain. I will post before and after pictures of this section come October-November if not sooner. Nice bait and switch to show pics of the dog park while claiming to be talking about other areas of the park. It’s also great that your standing by to take pics of a possible “I told you so moment” when it rains after all of the hard work members of your own family have put into restoring the park. You must be a joy at Christmas. Doug – I’m not going to argue with you. I would expect nothing less from a father than to defend what his child has attempted. The fault for the future failure lies with the adults who fail to accept the problems with this future flood control “Open Channel A” that is currently being used as a park and allowed this project to proceed. The expenditure of park monies to remove problems created by a failed storm drain system should also be questioned. Attempted? Of course you don’t want to argue. You’re so completely off base you don’t have an argument. The project is 95 percent complete, on time, under budget and exactly as proposed and agreed upon with the city. Ken, we wanted you to be the first to know that the new non skid was installed this afternoon.